for list of main articles about her. Rhiannon is one of the main people, a core protagonist, of the Mabinogi. She is strong willed and resourceful, yet vulnerable; magical yet very human; beautiful and ugly; arrogant yet patient in her suffering. She can be read as a complex feminist icon, yet she is quintessentially a woman of her time and place, Mediaeval Wales. Rhiannon appears in the first three Branches. Often she is absent from foreground action, but her influence still reaches far along the threads of the drama. Rhiannon Episodes: First Branch E2, E3; Second Branch E6; Third Branch; E1, E2, E3, E5. Rhiannon appears first as ryuedawt, a marvel, a wonder. 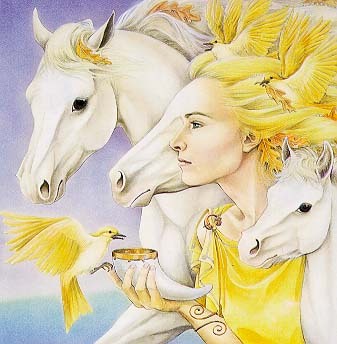 She rides towards everyone, arrayed in gorgeous gold silk, on a great pale and noble horse. She rides onward, calmly, without acknowledging her audience on Gorsedd Arberth, the ancestral mound of gathering. Challenged by her mystery, Pwyll Prince of Dyfed sends his men to follow her. But though Rhiannon rides peacefully, neither the man on foot, on a horse he fetched,; nor a rider sent with the best horse in Pwyll’s stables, can come near her. Even Pwyll himself cannot reach her until he asks her to let him come to her “for the sake of him you love best.” She rebukes him for forcing his horse, but she does consents to stop for him. Rhiannon then reveals her face, drawing back her veil, and her heart. The man she loves best is Pwyll himself! She tells him she has come especially to see him, to ask him to marry her. But she needs his aid to extricate herself from her betrothal to another man. For his part Pwyll is entirely willing for he sees that compared to her all other women are unlovely. Rhiannon and Pwyll speak of love, and agree to meet for their wedding in a year’s time. At that time and place Pwyll sits beside Rhiannon for the feast she has organised. When a princely young man arrives and requests a formal favour, Pwyll expansively agrees, only to find the request is for Rhiannon as bride. The young noble is Gwawl, the rejected betrothed. Rhiannon rebukes Pwyll once more for his stupid speech. Yet she also tells him exactly how they could win out of the bond of honour he has made. Rhiannon formally agrees to marry Gwawl at a new wedding feast in a year’s time. When this is underway Pwyll appears dressed as a beggar in clumsy rag boots. He requests a boon of Gwawl who cautiously grants it. Pwyll asks only that his small bag be filled with food. But it is Rhiannon’s enchanted bag, and the servants cannot fill it up so Gwawl will be forsworn and shamed. Following Rhiannon’s instructions, Pwyll explains the bag can only become full if a nobleman steps in it, and commands it to be full. Rhiannon encourages Gwawl to do it. Immediately Pwyll pulls the flexible bag over Gwawl’s head and ties it, trapping him. Pwyll sounds his hunting horn, and his band of men, hidden in the orchard, enter the hall and take charge. They kick and beat Gwawl as a badger-in-the-bag game, until he objects that this is not the right way for him to die. Heveydd Hen, Rhiannon’s father agrees, ruling the violence must stop. Rhiannon organises a contract with Gwawl to free her from their betrothal. She also ensures Gwawl vows not to seek vengeance. Gwawl leaves to seek a bath. Rhiannon and Pwyll complete their wedding feast, and go to bed to make each other happy. In the morning Rhiannon prompts Pwyll to give out proper gifts to the minstrels. When she arrives in his homeland of Dyfed, she distributes her own rich gifts of jewellery to all the nobles who come to meet her. She and Pwyll then rule together happily for several years. Continued in Rhiannon the mother.